October is National Energy Awareness Month. It was first adopted in 1991 by the Whitehouse to encourage government and organizations to raise awareness of the importance of sustainably managing the nation’s energy resources. Since then, it has expanded to include everyone. It is an important time for all businesses and households to consider ways to improve energy efficiency and reduce energy use. This makes a lot of sense and can save you money at the same time. 90% of the energy used in regular bulbs is in the form of heat, not light. Heat is wasted energy. By changing to LED’s you can have big savings in energy use. The most energy-intensive part of the food chain is the kitchen. Much more energy is used to refrigerate and prepare food in the home than is used to produce it in the first place. Replace old refrigerators and appliances with newer, energy saving models. Nationally, approximately 30% of energy used in buildings is used inefficiently or unnecessarily. Review and upgrade your heating and air conditioning systems, and use a programmable thermostat. Californians spend significantly less each month on their energy bill than the rest of the United States. You can do even better by monitoring your energy use. Energy efficiency provides an economic boost for all. Having more money in our pockets thanks to lower energy bills means we can spend it in restaurants and other labor-intensive services. Californians saved nearly $60 billion because of efficiency efforts from 1972-2006, allowing that spending to go toward other goods and services, creating 1.5 million full-time equivalent jobs with a $45 billion payroll. While the size of new TVs continues to grow, they are more energy efficient and their energy use have dropped. So too have their prices. Enough sunlight reaches the earth’s surface each minute to satisfy the world’s energy demands for an entire year. Solar energy systems are becoming increasingly important for providing renewable energy. Keep an eye on your monthly energy bill. A sudden change in increased energy use is a signal that you need to address before it gets out of hand. Make sure devices and lights are turned off when not in use. Create good routines and habits in your business and household around saving energy. Upgrade your holiday lights. As the holidays approach, discard your old tree lights and outside lights in favor of LED lights. LED lights also provide more flexibility with colors and settings. Get an Energy Assessment. 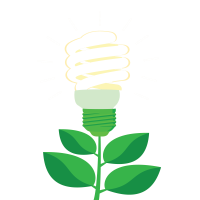 If you are a business, you can have an energy assessment performed to determine where you can save on energy use. It’s easy, just call the Santa Maria Valley Chamber of Commerce to get started!